The Division Open Beta contains an impressive array of bug fixes and improvements, matching almost every suggestion the community came up with. In addition to the solid fixes the Open Beta also includes brand new, unseen High End weapons: the Pakhan (LMG) and the Liberator (Assault Rifle). The dev's have decided to really hike the price of High End weapons in the Open Beta and I can see this continuing into the full game. Roughly speaking, orange weapons are now twice as expensive as they were before. 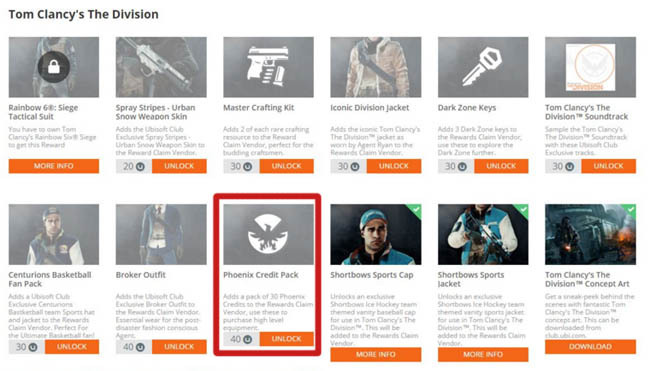 Thankfully, it's not that hard to gain Dark Zone credits in the game so the price increase makes sense in my mind. The Pakhan is an LMG and the version for sale from my vendor had a base DPS of 2910, 302 damage and a mag of 45. That DPS was fairly low considering that we saw Legendary (purple) weapons in the Closed Beta with DPS near the 4000 mark. However, it seems that any stock refreshes and your own level will affect the DPS and damage ratings on offer. I really like this weapon though, its high powered and tough, making it great against high level DZ enemies. The best part is the large magazine size which when upgraded gives you ample opportunity to take out two, maybe three enemies at a time. Swift - the Swift talent makes reloading a little faster. Destructive - grants you a 6% increase to the armour destruction value. Ferocious - Damage against Elite and Named enemies is increased by 5%. 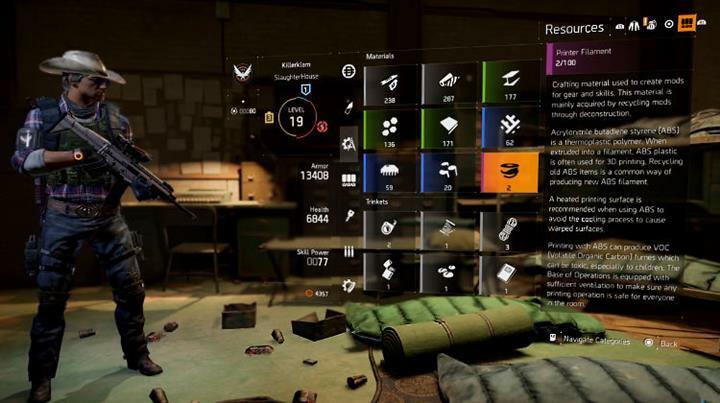 Players need to be at least Level 8 and Rank 12 before this weapon is available for purchase from the Dark Zone vendor. The Liberator is an Assault Rifle and my version came with modest DPS of 3272, 396 damage and a mag of 30. It's a good weapon with decent strength but it does have a pretty intense recoil. Competent - this talent gives players a 5% boost to damage following skill usage. It lasts for 10 seconds but considering the frequent spamming of skills, this perk certainly comes in handy for an almost permanent boost to damage. Dominant - whilst your Signature Skill is active any kills with this weapon will reduce the cooldown your other skills (3%). Talented - kills with this weapon increase Skill Power by 3%. The effect only lasts 5 seconds though and it doesn't stack. Again, agents must be Level 8 and Rank 12 to purchase this weapon in the Open Beta. The vendor is in the same Safe House as the one in the closed beta. Located between Morgan Library and the Sports Store (landmarks), there is an entrance on E 38th Street near the intersection with Madison Ave. 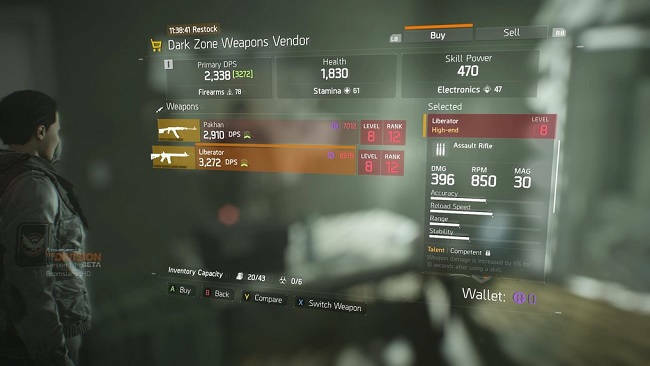 These High End weapons are only available through a particular Dark Zone vendor (mentioned above), which is one of several vendors located at permanent positions within the Dark Zone. Unlike other vendors, this High End gear doesn't refresh during the usual stock inventory refresh so you can always guarantee that orange weapons will be for sale. Pakhan vs Liberator - Which should you buy? Given that DZ credits are now harder to come by which weapon should you buy first? I've got to say that right now the Liberator is my favorite choice. Although the mag is smaller compared to the Pakhan, you can certainly melt through enemies with ease with this weapon.